Having consistent signage around the classroom creates an amazingly professional look! 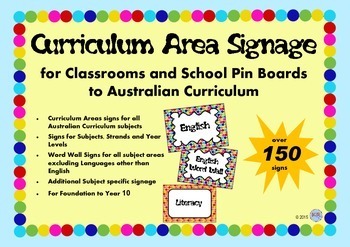 This package includes A4 pinboard title signs for all Curriculum Areas of the Australian Curriculum. Additionally there are signs for the strand and sub-strands for these areas as well. 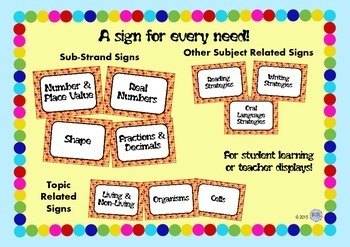 Plus signs for different topics within those areas including Foundation to Year 10. With over 150 A4 signs in this package these is bound to be one you can use for every display. Signage for OSHC, Out of School Hours Care or Vacation Care Centres. 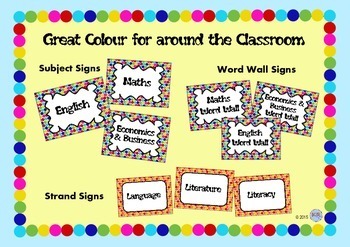 Colourful Sign template for Classroom or Learning Environments.